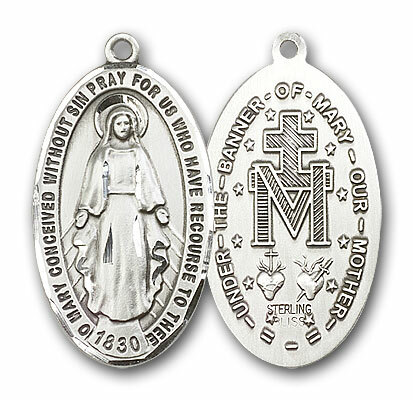 1 3/8 x 3/4-inch Sterling Silver Miraculous Medal. Comes as a ready-to-wear package with a 24" Rhodium Plated endless chain and a premium keepsake jewelry box. 3/4 x 1/2-inch Sterling Silver Miraculous Medal on a 18" Sterling Silver curb chain. 7/8 x 3/4-inch Sterling Silver Miraculous Medal. Comes as a ready-to-wear package with a 24" silver chain and a premium keepsake jewelry box. 7/8 x 5/8-inch Sterling Silver Miraculous Medal. 1 3/8 x 3/4-inch Sterling Silver Celtic Crucifix Medal on a 24" rhodium curb chain. Our 6 Millimeter Bead Blue/Pearl Rosary features our money-back guarantee. NOTE: The photo may only show part of this product, but the 6 Millimeter Bead Blue/Pearl Rosary is a full rosary. Our 6 Millimeter Bead Blue Swirl Rosary features our money-back guarantee. NOTE: The photo may only show part of this product, but the 6 Millimeter Bead Blue Swirl Rosary is a full rosary. Our 5 Millimeter Bead Blue Rosary features our money-back guarantee. NOTE: The photo may only show part of this product, but the 5 Millimeter Bead Blue Rosary is a full rosary. 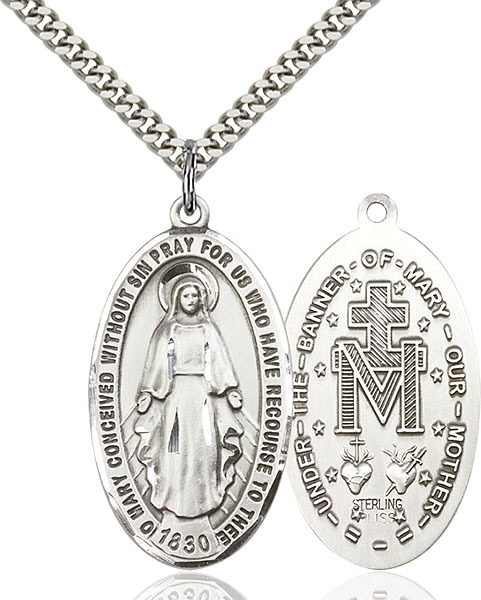 This Sterling Silver Miraculous Medal has passed our quality control assessment and meets our strict criteria to be a Catholic Shop product. Buy with confidence. Catholic Shop aims to carry the finest products on the market. Our staff has inspected and tested this Sterling Silver Miraculous Medal and found it to be worthy of our Satisfaction Guarantee.